Check out Dr. Audrey Yoon's Youtube videos "Obstructive Sleep Apnea -Dr. Audrey Yoon(Orthodontic treatment options for OSA)"
Miniscrew-assisted rapid palatal expansion (MARPE) is an eﬀective non-surgical and non-extraction treatment approach for expanding the upper jaw, known as the maxilla. A narrow maxilla is associated with nasal obstruction, crowded teeth, and hindered facial development. These features are one of the characteristics of obstructive sleep apnea (OSA). Conventional maxillary expander treatments are common to treat narrow maxilla. However, these are limited to children because the suture holding the maxillary bone together (known as the midpalatal suture) fuses around 12-15 years of age. MARPE is innovative because it extends this timeline by directly connecting the expander to the palatal bone. MARPE can be eﬀective for young adults whose suture has already fused. MARPE works by expanding the maxillary bone, thereby increasing the volume of the nasal cavity and oral cavity. This decreases nasal resistance and give the tongue more room to sit upwards and forwards in the mouth, making the airway larger. 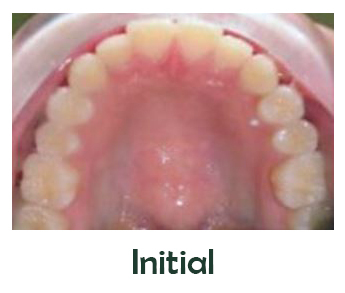 This process is achieved by placing a custom-made maxillary expander and mini-screws along the midpalatal suture. The procedure typically lasts 20-30 minutes under local anesthesia. Pain is minimal and can be managed with an over the counter painkiller for 1-2 days. After installation, the patient will activate the expander every day for 4-6 weeks by turning a screw. The expander will split the suture, and a gap will form between the front teeth. Orthodontic treatment will close the gap and help achieve a stable bite. The expander will remain in place until the new bone at the suture forms in 4-6 months. Besides its ability to treat a wider demographic of patients, MARPE also beneﬁts from fewer side eﬀects compared to conventional expander. MARPE uses mini-screws to directly apply forces to the midpalatal suture, whereas conventional expanders use the teeth as anchor units. MARPE avoids undesirable tooth movement and attains greater bone expansion while minimizing dental side eﬀects. In doing so, MARPE can achieve maximum airﬂow and reduce symptoms of OSA.